I haven’t written about Brexit for a while so I thought I would sally forth and have my say, not that it counts for anything. Over the past few days we have experienced the humiliation of the British prime minister by the European Union (EU). 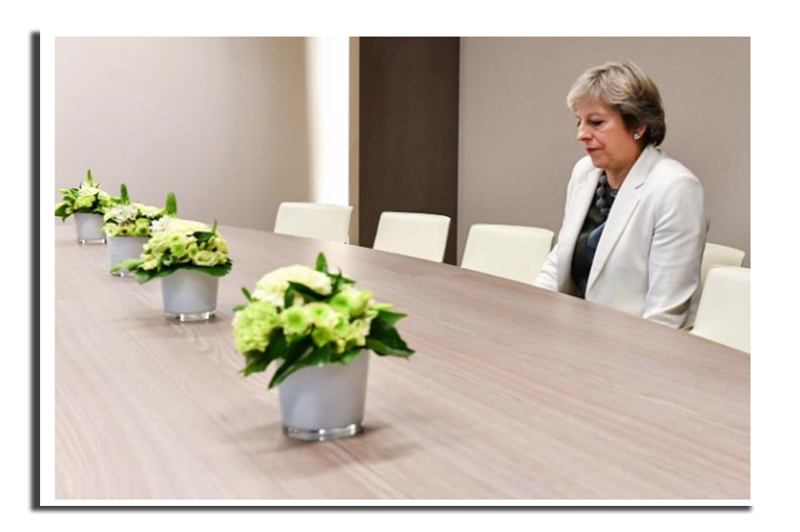 Again and again it would seem that the EU have gone out of their way to turn the screws on – whether it is about the latest pretend drama of the negotiations or the way that Theresa May has been treated by the other 27 leaders of EU countries at meetings. I understand that they want to prove a point but their reaches a point when such treatment starts to get people’s back up in Britain and will make it even harder to get whatever deal is negotiated to be accept by the British. Perhaps it is just me but I am just starting to resent this treatment and I am starting to wonder if we shouldn’t just cut our loses and see what would happen by going it alone. The logical part of my brain knows that this would be a hard road to go down but if the EU leaders still keep treating Britain the way that it is then we are going to reach a point that I will say enough is enough. I am sick of being told by the EU and member states that we will be so much more worse off than the EU. Yes the trade imbalance 40% to 17% and WTO rules will make British service industries much less competitive. This is undoubtedly true but that is still a huge chuck of the the EU’s market to start playing around with, especially when an awful lot of it ie agricultural products, can be sourced from other supplies outside of the EU. I have written in the past about how the EU wine production would be devastated by a no deal WTO rules outcome. I know this is unpopular to point out but we do drink an awful lot of EU produced wine which can be very easily replaced by non EU wine at very short notice. This would cause huge problems for France and Italy and the last thing that President Macron wants in 2019 is for the French farmers to be up in arms over loss of markets that they used to have. The photograph above is always shows what it is like on the roads into Dover when their is some form of interruption at the post. 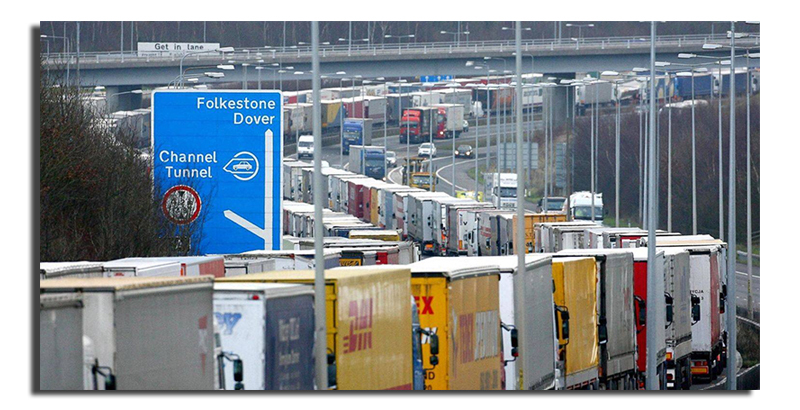 This is what Calais and other cross channel ports may look like should there be no satisfactory deal struck at the end of negotiations. It is insanity and that insanity will be felt on both sides of the channel. This is before we start to talk about the Irish problem which, no matter what the EU might want to pretend is as much an EU problem as British problem. The Irish government are very aware that they are exposed by this whole process if the EU mess things up as they are negotiating on their behalf. A lot has been written about the city of London losing out by a no deal outcome of the negotiations. This has always assumed that there is the capacity within the rest of the EU to provide the services both legal, economic and especially the money that the city of London can and does. The city is a complicated integrated entity that can’t just be uplifted and plonked in Frankfurt or Paris overnight. Perhaps in time it could be but not in 18 months which is all we have left. This also assumes that the key people are willing to move from a world city like London to the provincial joys of Frankfurt. This might sound very xenophobic but in 2015 Carsten Kengeter, a German investment banker, prefered to continue to live in Wimbledon even when he had been made boss of Deutsche Borse. Now there are many contributing factors to this decision but it does illustrate that it isn’t so easy to move people even if you move your trading location. Then there is the whole question of money. Britain pays a lot into the coffers of the EU and should we walk away with no deal then this would stop and either someone has got to make the money up or a lot of projects are going to have to be axed. Either option isn’t very palatable for the EU. Now I know that Brexit is crazy and wish we had voted to stay in the EU but we didn’t and we and the EU have got to come to terms with that. Last night on Newsnight they held a focus group about Brexit, the caveats at the start of the are worth bearing in mind, and the one thing I took from that is that the British people are starting to get just a little pissed off with the EU. It wouldn’t take that much for this view to harden and if this were the case then we may well be facing hardest and hardest Brexit which would be in no one’s real interest. However, should the EU keep this condescending attitude up then they are going to harm their own long term economic as well diplomatic interests. I will leave you with this photograph. 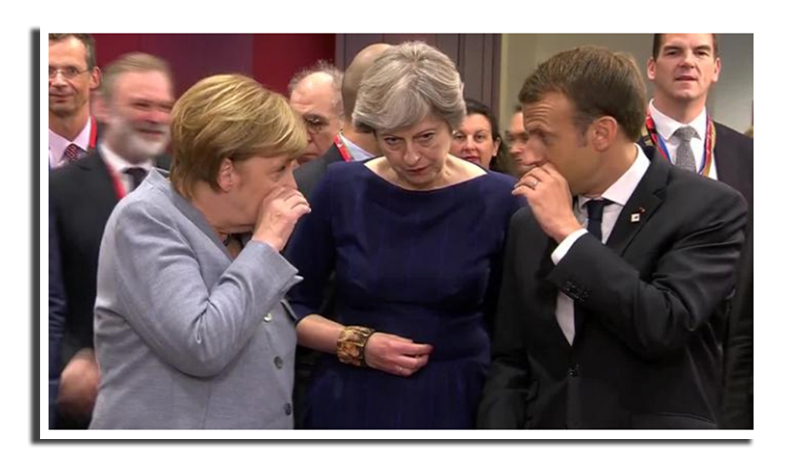 Here are Europe’s big three countries – it is unclear what they were talking about but it is believed it is the Iran deal. There is no EU functionary in sight because in the world of real politics these three dominate Europe. It might help everybody if the EU would like to recognise this before they humiliate the British prime minister again. This entry was posted in Brexit, European Referendum, Politics. Bookmark the permalink. I voted Leave and would do so again for I believe that our Common Law and political/judicial system is at odds with the Roman Law and political/judicial systems of most of the rEU. A circumstance that cannot be improved by ‘ever closer union’. I have some (limited) sympathy for the rEU – it is inherently protectionist and fears having a next door neighbour importing tariff free or reduced tariff goods from elsewhere, especially if we then export them to rEU countries, upsetting German mechanics and French farmers. I rather suspect the rEU is more than concerned about the possibility of a ‘transparent border’ between Northern Ireland and Eire allowing an unsupervised backdoor route for cheaper global imports. Personally I don’t think any ‘trade deal’ negotiated, if it is negotiated, will be accepted by several rEU countries. Better for the UK to actively prepare for ‘no deal’ while maintaining just enough negotiation to convince our future trading partners that we are ‘reliable’. Thanks for this. Unlike you I wanted to remain as I saw that this was in the best long term strategic interest of Britain. I have never thought for one moment that the EU is all milk and honey but overall I felt it was right to work closely with our nearest neighbours. That being said I suspect you may well be right about the problems associated with actually getting the EU 27 to agree a deal with Britain for the reasons you point out – it is too much an opportunity for other countries to try and get something for themselves out of the agreement that has nothing to do with Brexit – an example would be the movement to authoritarianism in the old communist countries of the east. They are in dispute with Brussels over all manner of things and this would provide a wonderful opportunity for points scoring. Equally I don’t believe that Frau Merkel is the power she once was after the last German general elections. Were she to fall or be saddled with a very unstable coalition then no one can say whether she would be able to get these other countries into line. In short the EU is in almost as much a mess as we are in the UK. Just as a footnote it is interesting to see all the backtracking that took place when the latest disparaging leaks came out for the meeting between Mr Juncker and the Prime Minister . Perhaps, just perhaps, the EU 27 might have woken up to the fact that they can take the piss of Britain so far before it becomes counterproductive . So I wish we hadn’t voted to leave but that has passed and now we have to make the best of this big pile of …. we have given ourselves.